Mickie's sister Angel is "dating" the President of the Red Brothers MC. Angel is young and naive and believes that Ransom is like the MC Presidents in the romance books, good but rough around the edges. Mickie knows better and is doing her best to try to convince her sister to stay away from the club. Cruz an FBI agent working undercover as a prospect at the Red Brothers and he hates it. He hates their drug dealing and the way they treat women. Cruz orchestrates a meeting with Mickie, lying about who he is to try to keep her away from the club, who are not happy with her interfering with Angel's relationship with their MC. Mickie and Cruz have strong chemistry but we can see right from the start that this relationship is going to end badly. Even knowing that Cruz is drawn to Mickie and can't keep away from her. 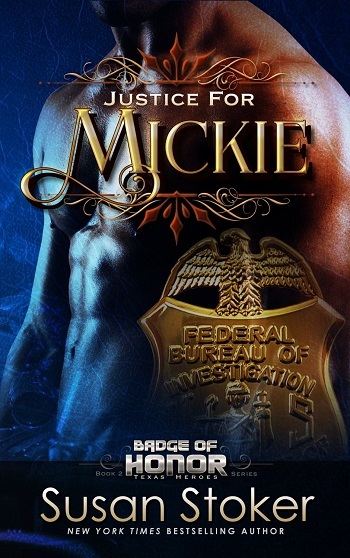 I had a good time reading Justice for Mickie. It is steamy and romantic without being over the top, with a good amount of action. I look forward to reading more of this series. For reviews & more info, check out our Justice for Mackenzie post. New York Times, USA Today, and Wall Street Journal Bestselling Author Susan Stoker has a heart as big as the state of Texas where she lives, but this all American girl has also spent the last fourteen years living in Missouri, California, Colorado, and Indiana. She’s married to a retired Army man who now gets to follow her around the country. 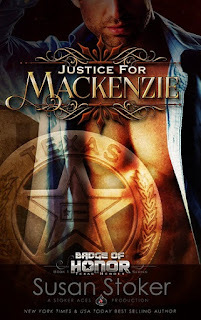 Veronica reviewed her personal copy of Justice for Mickie (Badge of Honor: Texas Heroes #2) by Susan Stoker for this post.